유익한 정보 제공 등 더 나은 혜택을 누리실 수 있습니다. * 표시 부분은 필수항목 입니다. All kit components of this kit are stable at 2 to 8°C. Any unused reconstituted standard should be discarded or frozen at -70°C. Standard can be frozen and thawed one time only without loss of immunoreactivity. 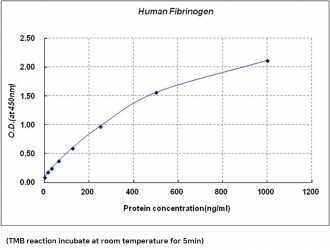 Fibrinogen is a soluble glycoprotein found in the plasma, with a molecular weight of 340kDa. It comprises of three pairs of non-identical polypeptide chains (alpha, 63.5kDa beta, 56kDa, and gamma, 47kDa chains) linked to each other by disulphide bonds. Low plasma fibrinogen concentrations are therefore associated with an increased risk of bleeding due to impaired primary and secondary hemostasis. Therefore Fibrinogen is an essential component of the blood coagulation system. Also it may play key roles in the process of atherosclerotic lesion formation, with subsequent effects on cardiovascular diseases. And increasing evidence from epidemiological studies suggests that elevated plasma fibrinogen levels are associated with an increased risk of ischaemic heart disease (IHD), stroke and other thromboembolism. Database link - SwissProt no.